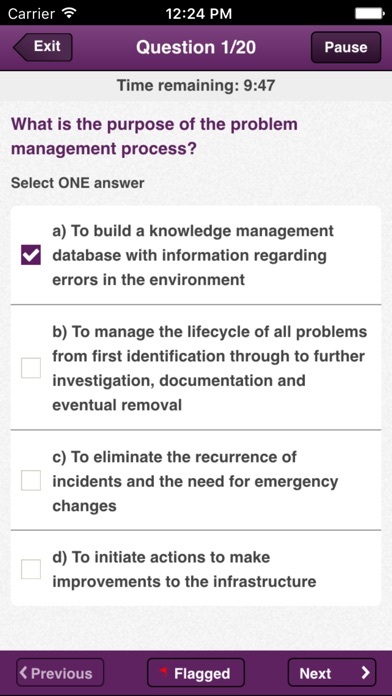 Great app idea in that I get access to more practice questions for the ITIL test. However, many of the questions are confusingly worded and don’t seem to focus on the points that matter. Also, there are plenty of spelling and grammar mistakes throughout. Worth the buy for more exposure to material, but don’t expect anything great. Studied thoroughly using this app and passed on first try. Good luck! The app stops responding to taps if I switch to another app and then come back to it during a Revision Card session. Would be nice to have a way to pickup where I left off during a revision card session. Overall the experience using this app is very clunky. Not well-designed. Needs some CSI! This is a great study tool, but if you have to step away and your device goes to sleep you have to start all over. I also wish there was question updates so we don’t keep getting the same questions over and over. As an adjunct to an online class this was a great aid in passing the exam. I especially liked the case study which brought all he pieces together in my mind. The revision cards helped with question wording. Why do these questions differ from the exam? The questions in this app are not the same as on the exam, and the EULA states they’re not responsible.... Slick, real slick. So, about two weeks ago, I was an ITIL and IT novice who decided to pursue certification to enhance my options. I used this app for about 90% of my study efforts and passed with a score of 80%. This app has a section for studying with revision cards, which I used to piece together the pieces of the ITIL process, then quizzed myself via shorter Quick Quizzes and later through longer Mock Exams until I scored 100’s or close. I did use other study materials, but sparingly, mainly just to organize the information from the app. The ITIL exam was difficult, as the questions are written to trick the test taker. However, if you slow down, take apart the questions, and then review a second time, you should be fine if you’ve used something like this app to learn definitions and the finer details of ITIL. If I had to do it again, I’d use a general guide to complement and arrange all the details from the app, but still, I went from a novice to ITIL certified in less than two weeks and did more than just barely pass. This app made it happen. I can say more than 60% questions i had in the exam from this app, i passed the exam from first try with 92.5 score only I missed 3 questions.